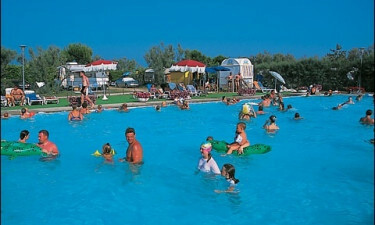 Enjoy the best of Tuscany at Lido Camping Village Campsite. 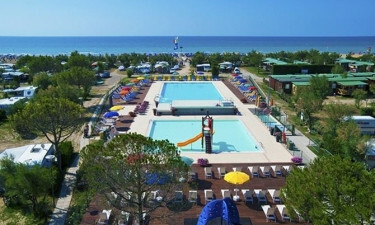 Sitting by the shores of beautiful Lake Bolsena to the north of Rome, the luxury camping site of Lido Camping Village is the perfect location for an idyllic family holiday. The huge family pool and shallow toddler’s pool are refreshingly free of gimmicks. Take a leisurely dip, or laze on the spacious terrace with a drink from the bar and marvel at the serenity of it all. The children’s grassy playground has slides and see-saws, whilst adults and teenagers have a choice of tennis, beach volley ball, basketball, 5-a-side football and table tennis. The real highlight, though, is the opportunity to learn how to windsurf or water ski at the on-site school. The campsite also has its own cinema, and at weekends there are theatre performances, musical events, cabaret and discos for all ages. August is a particularly special month, with parties organized on the beach. In addition to windsurfing and water skiing, the lake is also popular for canoeing, sailing and sport fishing. If tranquillity is what you crave, go for a swim in the wonderfully clear waters from one of the numerous sandy beaches. The lakeside towns of Bolsena, Marta and Capodimonte are rich in history and charm. Bolsena is captivatingly beautiful. Whilst wandering its ancient streets, be sure to stop at Gelateria Santa Cristina and sample the award-winning gourmet ice-cream of this traditional family emporium. The lovely island of Isola Bisentina can be reached by ferry and is a magical spot for swimming and a picnic. The Parco di Bomarzo is a delightful place to take the kids. Here they are free to roam the gardens and clamber on the gigantic rock carvings of animals and mythical creatures. Sitting majestically atop a large piece of volcanic rock, the town of Orvieto will take your breath away. Its numerous historic attractions also extend underground to a series of medieval caves. Famous too for its wine, it is one destination not to be missed. Rome, Assisi, Pitigliano or Perugia are all within easy reach by car for a truly great day out. The restaurant, pizzeria and bar are all spacious and lakeside. Watch the sunset over the lake from the terrace and enjoy classic Italian cuisine, a variety of pizzas and the liquid delights of the well-stocked bar. Takeaway is also available. A large supermarket caters to all your luxury camping needs and the baker produces fresh bread and other goods on a daily basis, providing campers with the energy they need to get the day started.